The owner of a brand new 2019 Chevrolet Corvette ZR1 hit the drag strip this past weekend with a set of sticky drag radial tires and the results were stunning – with the self-shifting Chevy supercar running a 10.12 at 135.91 miles per hour. When we learned that the 2019 Chevrolet Corvette ZR1 was motivated by the new LT5 V8 with 755 horsepower and 715 lb-ft of torque, we knew that it would be quick. When fitted with the 8-speed automatic, the C7 ZR1 should be quite a bit quicker than the C7 Z06 with the same gearbox and with the LT4 cars comfortably getting into the high-10s with a good driver and good tires, it makes sense that the ZR1 would run well into the 10s. However, the first results of a new Corvette ZR1 with the automatic transmission and sticky tires are nothing short of incredible, with the most powerful Corvette ever tickling the 9-second range. Earlier this month, the first footage of a 2019 Corvette ZR1 arrived online with a YouTuber struggling to get his manual transmission car down the track in the mid-11s. We knew that the car had far more in it, especially if we remove the impact of the driver. Fortunately, a member of CorvetteForum.com named wfarmer.z has a 2019 Corvette ZR1 with the 8-speed automatic transmission and this past weekend, he took his 755-horsepower Chevy supercar to the track. The car had an unspecified set of drag radials and just over 500 miles on the odometer, but without any seat time, the driver of this new ZR1 was able to get very near the 9-second range. 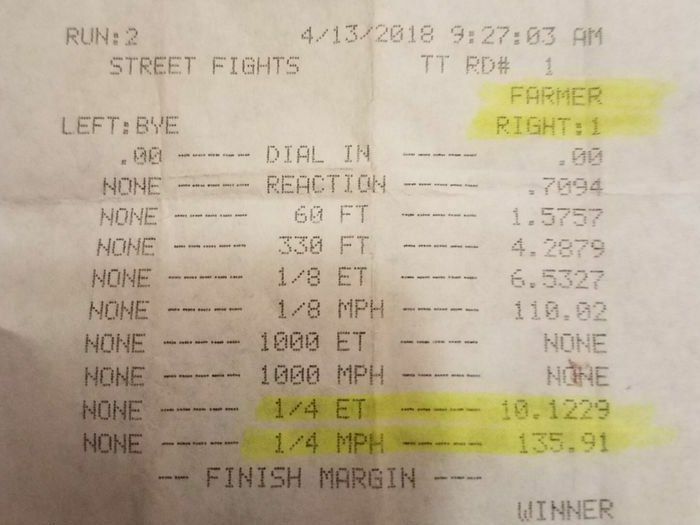 To be exact, this self-shifting 2019 Corvette ZR1 ran the quarter mile in 10.1229 seconds with a trap speed of 135.91 miles per hour. On this run, the LT5-powered car pulled a 1.57 short time and hit the 8th mile marker in 6.53 seconds (110mph). We don’t know the temperature, but the density altitude was around 450, so the ZR1 had pretty good air, but this is still a very impressive time for a stock car with a good set of tires. With some seat time, this Corvette ZR1 driver might be able to get into the 9s without any other changes (aside from the tires), but there is no question that with a simple tune – the new C7 ZR1 is a 9-second street car. Check out the videos below of this new Corvette laying down the 10.12 quarter mile from trackside and the Performance Data Recorder.